All right, Leaguers. Thanks to overwhelming support in favor of another round of official League of Melbotis Awards (aka: The Mellies), we're going to give this a shot. What the hell is a Mellie? 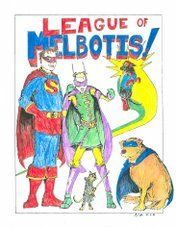 The Mellies are a celebration of the readership of The League of Melbotis. We ask you, the Leaguer, to give us some feedback not just on the super awesome content you can find here regularly at The League of Melbotis, but also we have some questions for you about this amazing world around us. Here are some questions from a previous go-round. Here are responses from day one, and day two and day three. 1) Try to answer all of the questions. The more answers we have, the more fun this will be. 2) All answers will be reprinted. 3) Thus, try to keep your responses down to a sentence or two. I don't want this turning into War and Peace. That said, a "why" is usually going to be key to your response. 4) I will also, of course, list all answers, and then make a special note of the answer that wins the 2006 Mellie. This may or may not be preceeded by a comment from The League as to why the comment took the coveted award. The League will probably also chime in with his own answer. 6) I'm considering sending a special "thank you" to all entrants who also include their street address. So, you know, include your street address. And now, your nominating categories for the 2006 Mellies! a) Why does the League obsess about _____? 6) You know what was the most amazing day this year? 9) I never mentioned it, but you know who is kind of hot..? That's it! Send in your submissions, and we'll be getting back to you guys on this late in March.